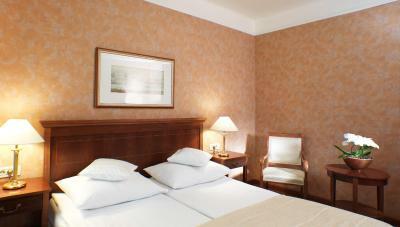 Lock in a great price for Grand Hotel Toplice - Small Luxury Hotels of the World – rated 8.4 by recent guests! The view from room on the lake and castle is spectacular .. Staffs, Breakfast, Location very good. My room has very good lake view from the balcony. breakfast was amazing. The location and the staff were top notch. 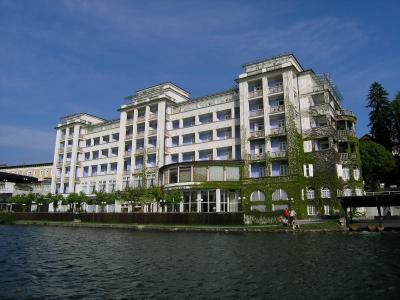 The spa was very nicely situated with a lakeside view. Fabulous location and view. Very few places could compare to this hotel. Staff, service and restaurants were exceptional. The staff were great, very pleasant and helpful. The room was comfortable and had a great view of Lake Bled, loved the balcony. I was in room 306. The hotel is close to everything and right on the lake. Breakfast was very good, plenty of selections, plus, you can order omelets and such. Enjoyed the spa, Mia was the nail tech for my pedi and did a terrific job!! Beautiful view of the lake and castle from our balcony. The hotel is very elegant and nearly every room has a lovely view, though I would suggest a room on the lake side for best views. The beds are comfortable and the rooms a sufficient size. 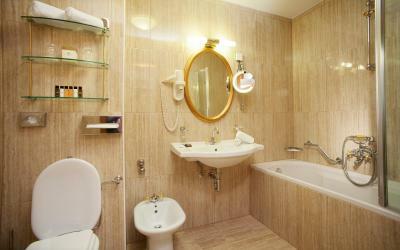 The bathrooms have nice toiletries and are a good size as well and nice fluffy robes and free slippers are provided. We had a nice sized balcony with two chairs and a table. 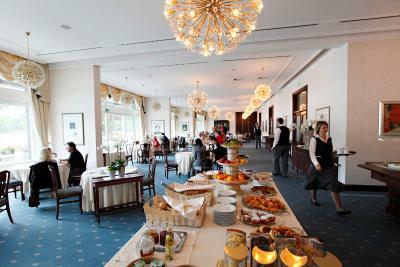 We also had a wonderful breakfast provided in the price of our reservation. 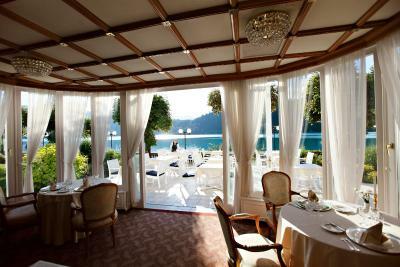 The breakfast is very nice with excellent coffee and views of the lake. 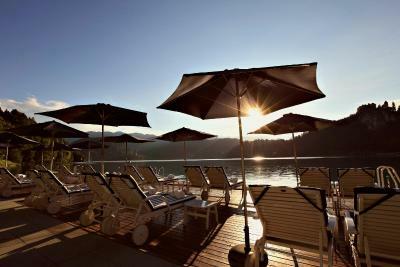 The location cannot be beat, on the lake and near all the best attractions, most walkable. I would love to stay again! Spacious room, helpful staff, felt more like s home than many hotels. We particularly liked the fact that the manager too the time to welcome everyone and to host a drinks reception! 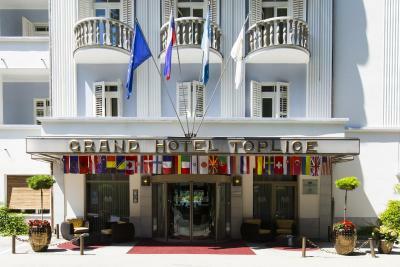 Grand Hotel Toplice - Small Luxury Hotels of the World This rating is a reflection of how the property compares to the industry standard when it comes to price, facilities and services available. It's based on a self-evaluation by the property. Use this rating to help choose your stay! 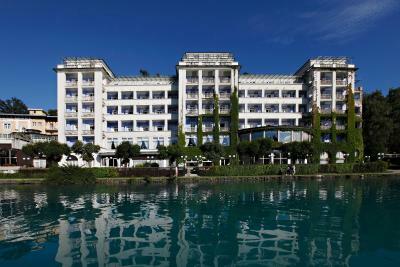 Located on the shores of Lake Bled, the elegant Grand Hotel Toplice features panoramic views of the lake and the Alps. 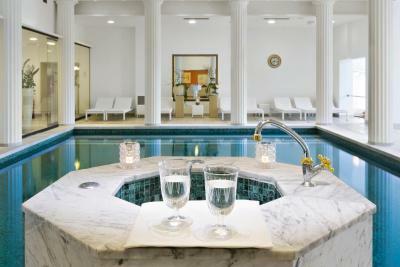 The hotel has a boutique wellness center with a thermal pool, saunas and various massage and beauty treatments. Guests can relax at the lake-view terrace. Free WiFi is provided throught the property. 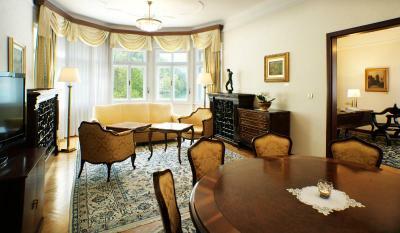 All rooms and suites at Grand Hotel Toplice are air-conditioned and include a private balcony. Most of them provide views of Lake Bled. The accommodations units also feature a flat-screen cable TV, a mini-bar, and a safety deposit box. 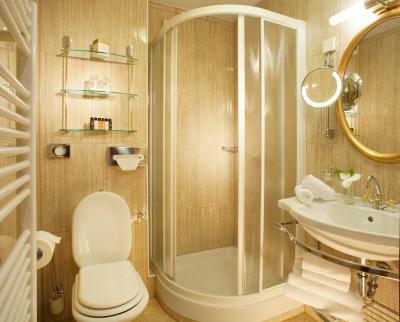 Private bathrooms consist of a bath or a shower, a hairdryer and free toiletries. 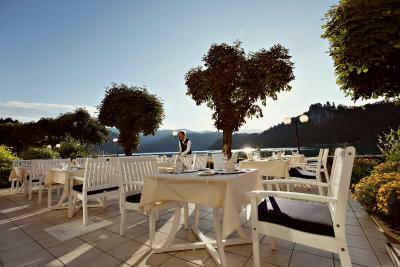 Two restaurants are located on-site and provide a selected gastronomic journey of Slovenian and international cuisine. 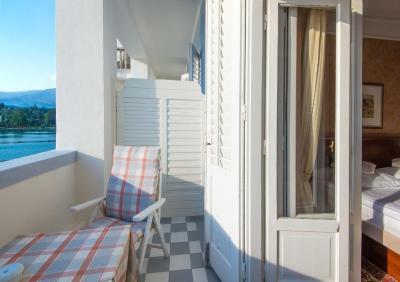 The hotel also includes several bars, a cafe and a spacious sun terrace. 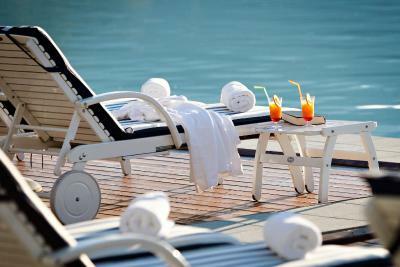 In the warmer months, guests can relax at the private beach area with loungers and parasols or rent a row boat and explore the lake (subject to weather conditions). 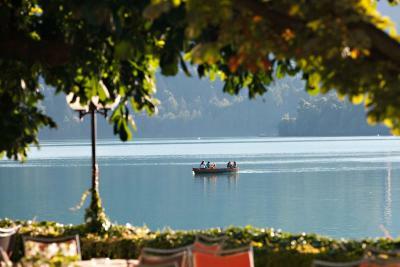 Hiking and cycling trails can be found all around the Bled Lake. Bled Castle is 0.6 mi away, while The Bled Golf and Country Club is at a distance of 2.5 mi. 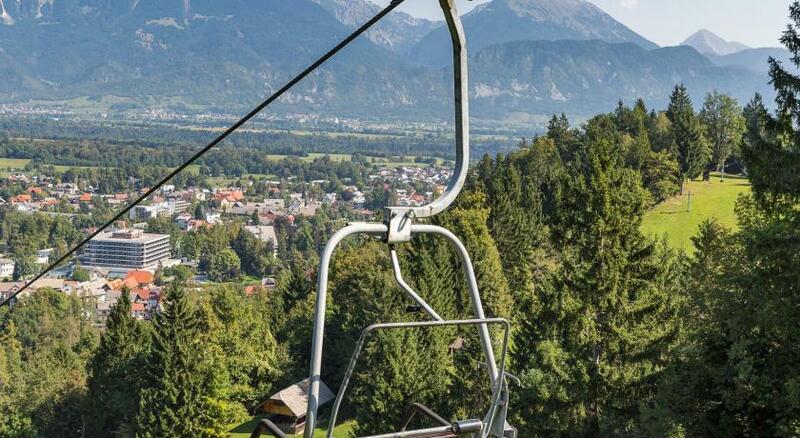 The city of Ljubljana is 34 mi away, while Triglav National Park can be reached in 6.2 mi. Ljubljana Airport is at a distance of 22 mi. Free public parking is available on site. 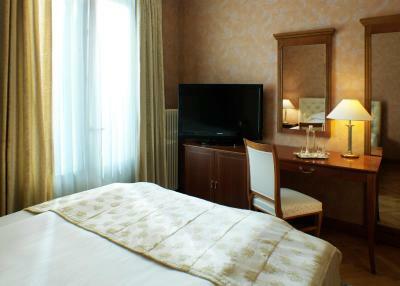 When would you like to stay at Grand Hotel Toplice - Small Luxury Hotels of the World? 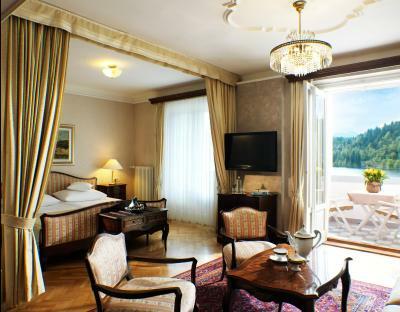 This elegantly decorated air-conditioned suite includes a balcony with views of Lake Bled. 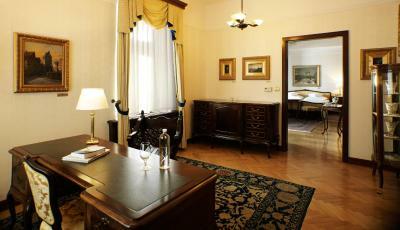 The suite consists of a seating area with a sofa and a flat-screen cable TV, as well as a mini-bar and a safe. 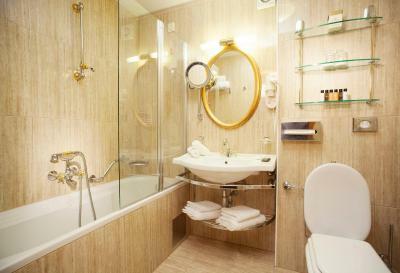 A private bathroom includes a bath tub or a shower, a hairdryer and free toiletries. This elegantly decorated air-conditioned room includes a balcony, a flat-screen cable TV, as well as a mini-bar and a safe. 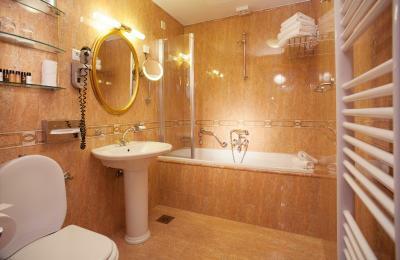 A private bathroom includes a bath tub or a shower, a hairdryer and free toiletries. 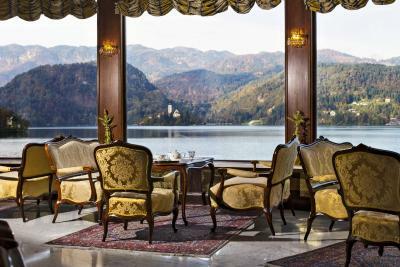 This spacious and elegantly decorated air-conditioned suite includes a balcony with views of Lake Bled. The suite consists of a seating area with a sofa, a dining table and a flat-screen cable TV, as well as a mini-bar and a safe. A private bathroom includes a bathtub, a hairdryer and free toiletries. 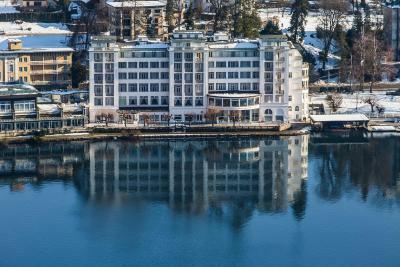 This elegantly decorated air-conditioned room includes a balcony with views of Lake Bled, a flat-screen cable TV, as well as a mini-bar and a safe. 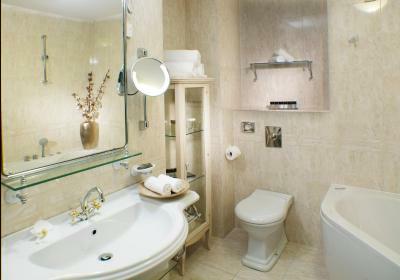 A private bathroom includes a bath tub or a shower, a hairdryer and free toiletries. 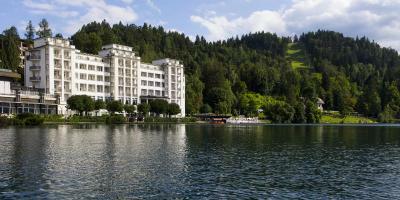 - Holiday entertainment program for children with Zaki the Swan at Hotel Savica. 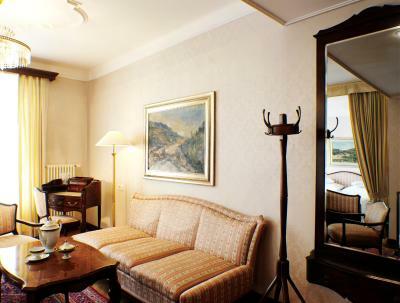 The Grand Hotel Toplice boasts a rich history, offering traditional style and sumptuous comfort for the guests' enjoyment and relaxation. 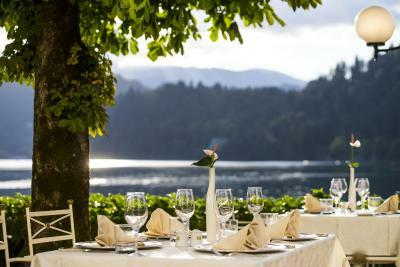 The hotel is a member of the Small Luxury Hotels chain and is frequented by people looking for the most elegant accommodation by Lake Bled, as well as golfers and conference guests. The hotel features a private beach and boathouse. A thermal swimming pool overlooking the lake has a temperature of 22 degrees and is filled daily with fresh thermal water from the well. 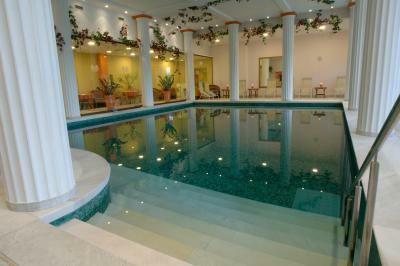 Next to the pool there is a boutique wellness centre. Hotel guests can choose from two restaurants. The hotel restaurant Julijana Restaurant is distinguished by its intimate atmosphere and is run by chef Simon Bertoncelj, member of the Slovenian culinary team, whose culinary vision is based on fresh, local and seasonal ingredients. 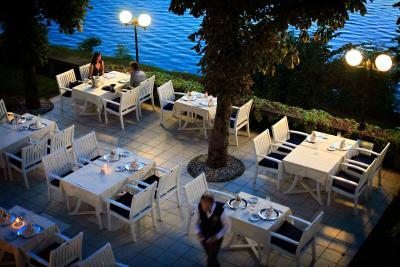 The more casual restaurant is situated next to Julijana and is open in only on the terrace in the warmer months. There are two bars in the hotel. The Aperitiv Bar lounge with live piano music in the evenings and the Jezero Bar, situated on the chestnut-shaded terrace by the lake and only open in the summer. 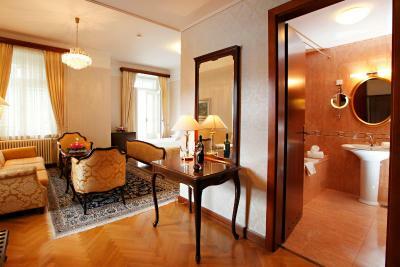 House Rules Grand Hotel Toplice - Small Luxury Hotels of the World takes special requests – add in the next step! 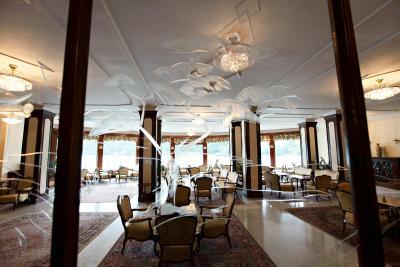 Grand Hotel Toplice - Small Luxury Hotels of the World accepts these cards and reserves the right to temporarily hold an amount prior to arrival. The hotel should be branded as historic hotel. It is one of these old school hotels where there is a lot of staff and people are nice etc. I did not mind that the rooms are dated as thy are extremely clean. And the voew from the room was magnificent. Also the pool area looks great and is also extremely celan. The bed was very uncomfortable. Please change the matrace!!! The Panorama Restaurant outside area was shut as were the outside areas to the breakfast rooms the spa, the bar areas and the lounge. The outside decking area was also shut and in need of repair. Other hotels had their outside spaces ready and operational.The Panorama outside space was a commercial opportunity missed. The Wifi coverage is poor. We also walked in one evening and there was nobody on the desk (they were watching football in a side room) with all of the keys on display for anyone to take and open up rooms. Security is poor and needs changing to swipe cards to the rooms, the spa, and the main entrance out of hours. Breakfast was great with a lot of choices and the view from the breakfast room was fantastic. Services was excellent also and the staff very friendly. The room and balcony were great. Definitely should have taken the upgrade to a lake view as the street side of the hotel rooms are darker - at least in Spring. That was a choice, the lounges overlooking the lake were beautiful. Location was great - on the lake, close to bus stops and plenty of nice local restaurants. Walk to the castle is easy and a pleasant trip with great views. 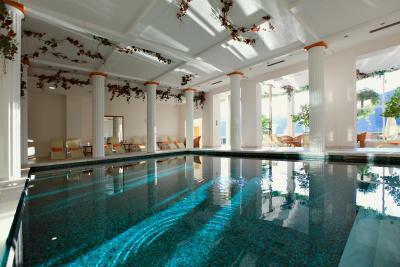 The spa was lovely, the pool is very fresh but fabulous when you get in. Staff so helpful and friendly. Bus to Triglav national park cheap and convenient for walk to the water falls. We strongly feel that hotel personnel didn’t like us because we are a family with a small kid.As i understand they are not used to small kids in the hotel. (even we got a warn that they can charge us some costs because of some play-doh staff that we had:))So it is not a kid friendly hotel and need to think again if you have a small child).Swimming pool is a part of Spa and it is 18 degree everytime.Much better to stay in the rooms with lake view.Other rooms are so depressive which is looking at parking area.Before visit please be sure of it. Must be one of the best locations in Bled. The view from my 4th floor balcony over the lake was pretty special. The rooms are perhaps a little old-fashioned & it was quite expensive but the views more than made up for it. Bled is an easy trip from Ljubljana (& is a good base for an easy visit to Lake Bohinj). I am not sure how this is considered one of the 'Small Luxury Hotels of the world'. It is very dated and the beds in the room were extremely uncomfortable and noisy. The facilities in the room were basic and it was quite awkward to walk around and get out onto the balcony. Tea and coffee in the room were in short supply although they were perfectly happy to bring more once we called reception. I absolutely would not put this in the luxury category. The location if fabulous and the hotel is extremely clean. Breakfast was delicious. it was too loud,I could hear the people in the next room. The water in the swimming pool is cold. This is unpalatable. We were really disappointed, we will never book this hotel again. Staffs, some of them are cold, service at breakfast very slow, room with old furniture and not comfortable bed. I would not call this a luxury hotel. 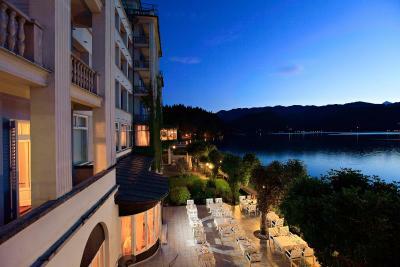 The best location with beautiful lakeside view.